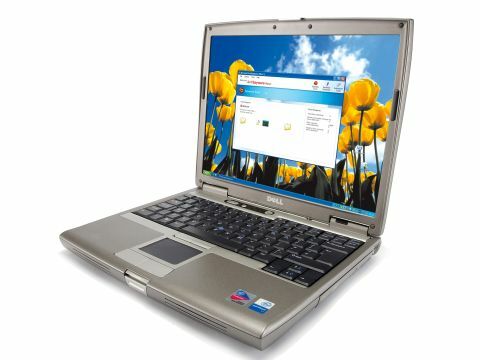 The Inspiron notebook range from Dell is a big hit in the home and leisure-use laptop market. However, the Round Rock, Texas giant also has a crushingly successful line of notebooks aimed at corporate users, namely the Latitude range. Question is, if you're buying privately rather than for a business, does it make any sense to land a Latitude? Well, make no mistake, in terms of aesthetic appeal, the D610 is a distinctly joyless effort. Corporate notebooks aren't sold on looks and this is a deeply anonymous laptop in the tried and tested Latitude fashion. Still, it's well assembled and no doubt built to withstand the abuse typically delivered by busy business users rather than careful private owners. What's more, the appearance of both a trackpad and trackpoint means aficionados of both input methods are well catered for. However, the best aspect of the chassis is its size and weight. Short of a true ultra-light, this is about as compact and portable as you could wish for at just over 2kg. As for the overall specification, it's very much par for the second-generation Centrino course - and that's mostly good news. You certainly won't find us complaining about the 1.6GHz Pentium-M processor. It delivers more than enough oomph for all but the most demanding multimedia applications. Likewise, the Intel 915GM motherboard chipset ticks all the usual specification checkboxes, including dual-channel DDR2 memory support (in this case Dell has configured 512MB of 400MHz DDR2 memory) and the latest 533MHz Pentium M bus. It also delivers decent battery life. In testing we achieved between two-and-a-half and three hours depending on usage. As you'd expect from a system designed for business use, there's a full gambit of networking capabilities, including Intel's b/g Wi-Fi adapter, Gigabit LAN and Bluetooth. Graphics duties, meanwhile, are handled by Intel's GMA 900 chip running on a PCI Express graphics interface. It's no 3D gaming powerhouse, but it's among the best integrated video chips currently available and comes complete with both VGA and S-Video outputs should you want to hook up a projector for presentations or a TV for video playback. As for the image quality of the unit's own 14.1-inch LCD display, however, we've some serious dirt to dish. Unfortunately, it's the worst kind of old-school LCD panel. Colours are washed out with poor contrast, while viewing angles can only be described as catastrophic. Response times are poor, too. It's symptomatic of the market the notebook is aimed at: corporate drones do not require a dynamic and responsive display. They simply need basic viewing functionality and that's all this Dell delivers. Indeed, you only need browse Dell's Inspiron range to see that far superior notebooks can be had for the near £900 asking price of the D610. For £150 less, for instance, you can bag an Inspiron 6000, which matches or betters the D610 on almost every count and boasts an infinitely more pleasing 15.4-inch widescreen display, albeit backed by a shorter one-year warranty. Furthermore, if it's style you're after, Sony's stunning F-Series notebook, complete with an eyepopping X-Black LCD panel, is also available for around the same money.